Compete for a share of €8,000! 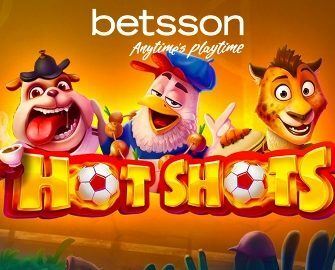 Collect shots and tickets in Betsson’s own version of the 2018 FIFA World Cup when playing on Hot Shots and other selected slots from iSoftbet. Three weekly leader board races and a final prize draw are ahead of us until the end of the football tournament in Russia. The TOP collectors of each tournament will win cash prizes while the Final Raffle will award another 30 players with more cash prize. 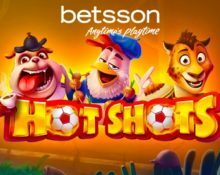 Betsson is taking the football fever to a new level with their latest Hot Shots campaign. A huge prize pool of €8,000 is waiting to be won among the top scorers in three slot races as well as a Final Raffle. At the center are iSoftbet slots such as Hot Shots or Legend of Loki. A new challenge waits every week where players have to collect “shots” to place on the leader board while at the same time earning tickets to the Final Raffle. All prizes are cash and will be credited the following working day after the the race has ended or after the raffle. 29th June – 3rd July 2018: Earn one “shot” toward the leader board for every €2.00 wagered on Hot Shots or Alice Adventure. Ten shots will award one ticket to the Final Raffle. At the end of the race, the TOP30 scorers will win €50 each. 6th – 15th July 2018: Earn one “shot” toward the leader board for every €2.00 wagered on Hot Shots or Booster. Ten shots will award one ticket to the Final Raffle. At the end of the race, the TOP40 scorers will win €50 each. Every ten “shots” collected during the weekly races will be converted to one ticket to the raffle. There is no limit to the amount of tickets per player. The TOP500 ticket earners will go into the Final Raffle in which Betsson will randomly select 30 tickets to win €100 in cash each. Prizes are credited on 16th June 2018. Launched in 2001, the casino is operated by BML Group Ltd. and holds MGA Malta and UK licenses. 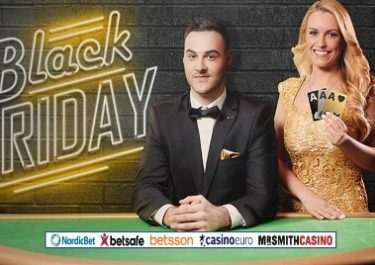 Betsson offers Sportsbook, Poker, Bingo, Scratch Cards, Games, Casino and Live Casino with games from acclaimed suppliers such as Netent, 1×2 Gaming, 2BY2 Gaming, Ainsworth, Aristocrat, Bally, Barcrest, Big Time Gaming, Blueprint Gaming, ELK Studios, Fantasma, Foxium, iSoftbet, Jadestone, Leander, Lightning Box, Microgaming, NextGen, Novomatic, NYX Interactive, ONgame, Play’n GO, Quickspin, Realistic Games, Red Tiger Gaming, Scientific Games, StakeLogic, Thunderkick, Williams Interactive and Yggdrasil. The LIVE Casino tables are powered by Evolution Gaming, Extreme Live Gaming and NetEnt Live.